Introduction: Imatinib is a bcr-abl tyrosine kinase inhibitor which has revolutionized the treatment for chronic myeloid leukemia (CML). Even though there is much data on CML chronic phase, there is limited data on imatinib-naοve advanced phase CML. Materials and Methods: We retrospectively analysed 90 patients with advanced phase CML (accelerated phase [AP]: 51 and blast crisis [BC]: 39), patients who received imatinib as frontline therapy. Results: The median age of presentation in CML-AP and CML-BC were 32 years (12-61) and 39 years (8-59), respectively. Imatinib at 600 mg/day was initiated within 2 weeks of diagnosis. Median time to complete hematological response in both CML-AP and CML-BC was 3 months (CML-AP: 1-9 months and CML-BC: 1-14 months). 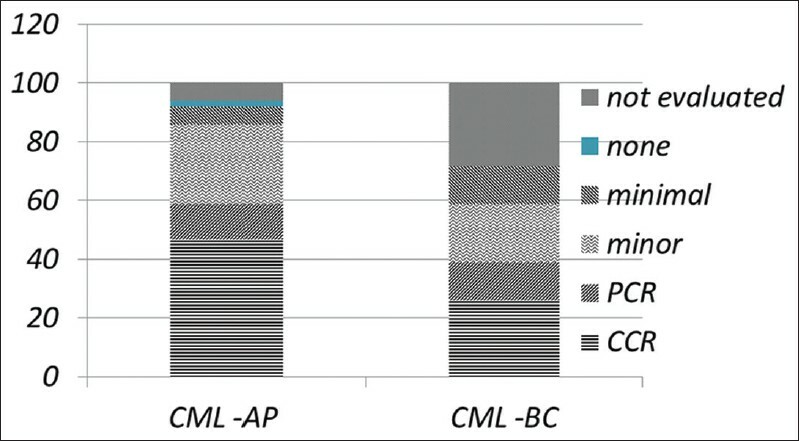 At 6 months 30 (59%) CML-AP and 15 (38%) CML-BC patients achieved major cytogenetic response (MCyR), of them 24 (47%) and 10 (25.6%) being the complete cytogenetic response, respectively. 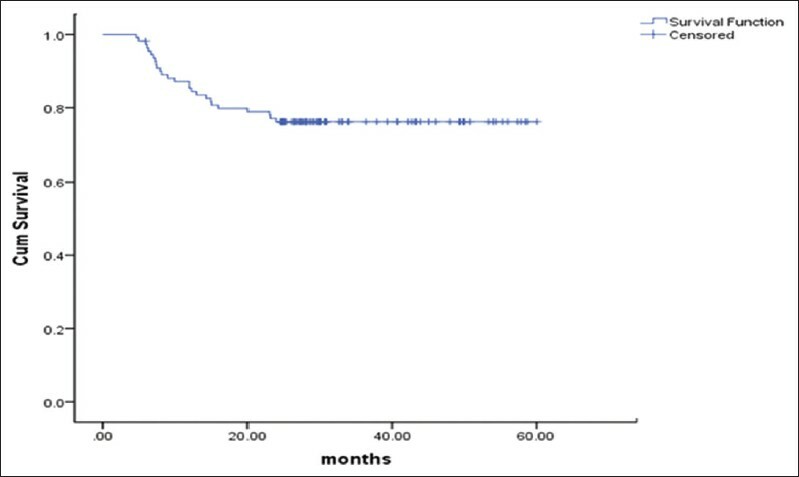 At a median follow-up of 41 months, the median overall survival in CML-AP was 61 months, but in CML-BC it was 14 months. The median progression-free survival and event-free survival were 30 months and 23 months in CML-AP and 14 and 12 months in CML-BC, respectively. On univariate analysis, performance status (PS), spleen size, and MCyR predicted survival in AP, whereas in BC, platelet count, PS, and early MCyR were predictive. Non-hematologic and hematologic adverse events were observed in 80% and 60% of patients, respectively. Dose was reduced in 10% of patients for grade IV toxicity and interrupted in 30% for grade III toxicity. Conclusion: Front-line imatinib is an option in advanced phases of CML especially in CML-AP in low-resource countries, where stem cell transplantation and alternate TKIs are not available. Purpose: Concurrent chemoradiation is the current standard of care in locally advanced head and neck cancer. But, in our setup, many patients of carcinoma larynx are treated with only radical radiotherapy because of poor general condition of the patients. This study was performed to assess the influence radical radiotherapy alone on functional preservation of larynx. Materials and Methods: 110 previously untreated patients with invasive squamous cell carcinoma of larynx were treated with radical radiotherapy alone between January 2006 and June 2009. Conventional one daily fraction of 2 Gy with total doses of 60-66 Gy was used. Voice preservation and local control at median follow-up period of 2 years were analyzed. Several host, tumor, and treatment parameters were also analyzed. Results: Among 110 patients, preservation of larynx was possible in 78 patients (71%). With radical radiotherapy alone, excellent preservation of larynx was achieved in stage I (88.9%) and stage II (75%) disease, while in advanced stages, results were not so encouraging. In stage III and stage IVA, larynx preservation was only 72.4% and 65.3%, respectively. Patients without any cartilage invasion had significantly better laryngeal preservation rate as compared to patients with cartilage invasion. (78.9% vs. 35.3%; P = 0.008). 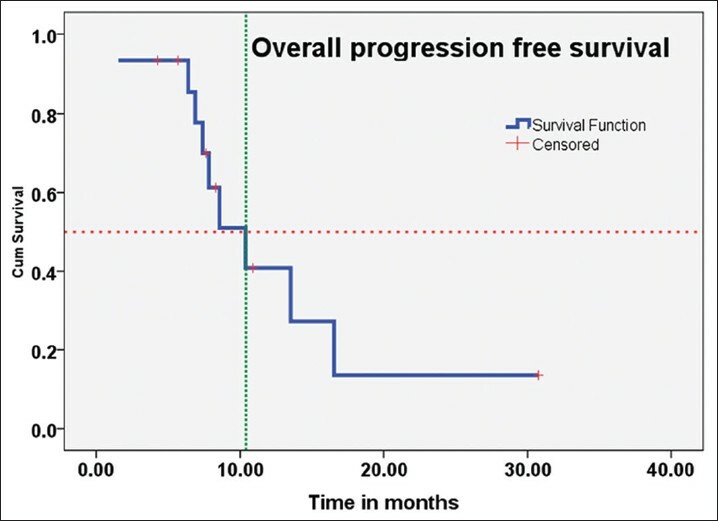 Conclusion: Though concurrent chemoradiation is the standard of care in preservation of voice in laryngeal cancer, definitive radiotherapy alone may also be a good option in terms of preservation of larynx in patients of laryngeal cancer in community practice in the developing world where most of the patients cannot tolerate concurrent chemoradiation. Context: Current NCCN guidelines do not consider staging laparoscopy mandatory for detection of metastasis in gastroesophageal junction (GEJ) and gastric cancer. Aims: To determine the rate of detection of metastasis on staging laparoscopy in GEJ and gastric cancer in Pakistani population and determine the prognostic significance of cytology versus biopsy positive metastatic disease. Settings and Design: Retrospective study conducted from January 2005 to June 2013. Materials and Methods: Demographics, clinicopathological characteristics and laparoscopic findings of 149 patients were compared. Statistical Analysis Used: Categorical variables were represented as frequencies and percentages and significance was determined using Chi square test. Overall survival was calculated from the date of staging laparoscopy to the date of death/last follow-up. 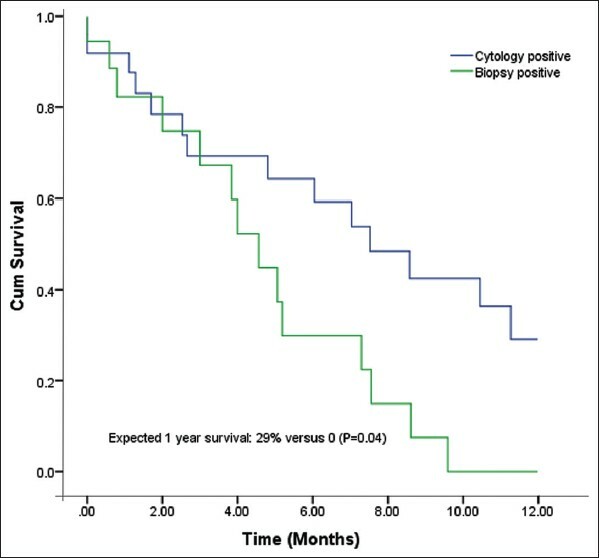 Survival for cytology versus biopsy positive metastatic disease was calculated using Kaplan Meier curves and significance determined with Log rank test. Results: Overall, metastases were detected in 40% of patients on staging. Laparoscopy detected metastasis in significantly high number of gastric cancers (48% versus 28%) (P = 0.01). Peritoneal nodules were more frequent with gastric tumors (40% versus 23%) and also were more likely to be malignant (58% versus 35%). 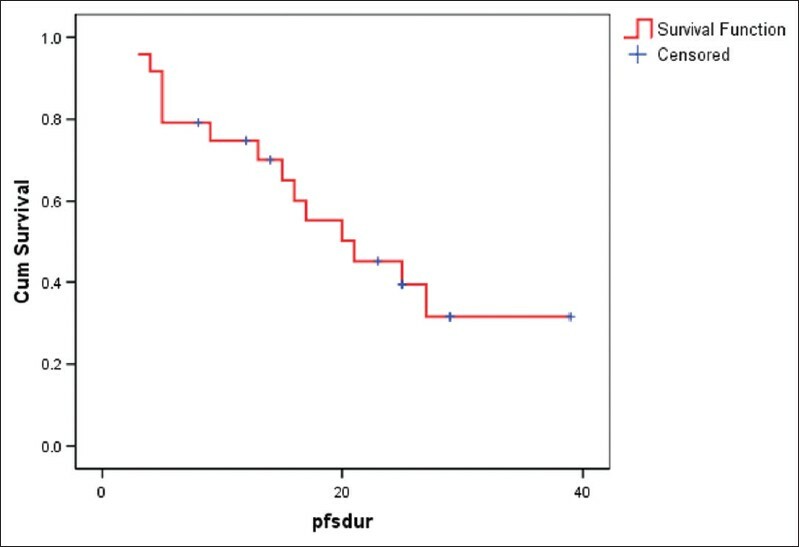 Expected one year survival in patients with positive cytology (peritoneal washing/ascitic fluid) was significantly higher than patients with a positive peritoneal nodule biopsy (29% versus 0) (P = 0.04). On univariate analysis this was the only significant factor for increased risk of death (P = 0.03, HR = 2.5, CI = 1.04-5.98). Conclusions: Staging laparoscopy detects metastatic disease in a significant number of patients deemed non metastatic on preoperative imaging. Prognostically, cytology positive metastatic cancer may be different from biopsy positive cancer. Background: Plasma cell leukemia (PCL) is a rare aggressive variant of multiple myeloma (MM) characterized by a fulminant course and poor prognosis. Flow cytometry (FCM) is very useful in the diagnosis of the plasma cell leukemia. Herein, we present 10 cases of PCL. Materials and Methods: We retrospectively studied immunophenotypic profile of 10 cases of PCL from Jan 2009 to Dec 2013 using 5 parameters, 6 color flow cytometric analysis. We also studied their clinical presentation and other laboratory findings. Results: Common clinical features at presentation were weakness, bone pain, anemia, thrombocytopenia and osteolytic lesions. Plasma cell population were identified by strong expression of CD38 and co-expression of CD38 and CD138. CD56 was expressed in 20% cases. CD19 and CD117 were negative in all cases. Conclusions: Immunophenotyping is highly useful to differentiate PCL from other chronic lymphoproliferative disorders with plasmacytoid morphology as well as from non-neoplastic reactive plasma cells. Co-expression of CD38 and CD138 is a best combination to identify the plasma cells by using FCM. Objective: To study the safety and efficacy of weekly chemotherapy as part of induction chemotherapy, in locally advanced head and neck cancer for patients, who are unfit for upfront radical treatment. Materials and Methods: It is a retrospective analysis of on-use weekly chemotherapy as Induction chemotherapy in locally advanced head and neck cancer, who are technically unresectable are unfit for upfront radical treatment. Induction chemotherapy given was a 2 drug combination of paclitaxel (80 mg/m 2 ) and carboplatin AUC 2. The decision to give weekly induction chemotherapy was given on the basis of presence of 2 more following features: Poor performance status (ECOG PS 2-3), presence of uncontrolled co morbidities, BMI below 18.5 kg/m 2 and age more than 60 years. The Statistical Package for the Social Sciences software (SPSS version 16.0) was used for analysis. The response rates, toxicity (accordance with CTCAE vs. 4.02), completion rate (Cp) of radical intent treatment post neoadjuvant chemotherapy (NACT), progression-free survival (PFS) and overall survival (OS) are reported. Results: Fifteen patients were considered for such therapy. Fourteen out of fifteen patients completed NACT. The median numbers of planned weekly cycles were 6 (3-8). Response (CR + PR) was seen in 10 patients. Overall grade 3-4 toxicity was seen in 6 patients. No toxicity related mortality was noted. The calculated completion rate (Cp) of radical intent treatment post NACT was 46.7%. The median PFS and OS were 10.36 months (95% CI 6.73-14.00 months) and 16.53 months (95% CI 4.22-28.84). 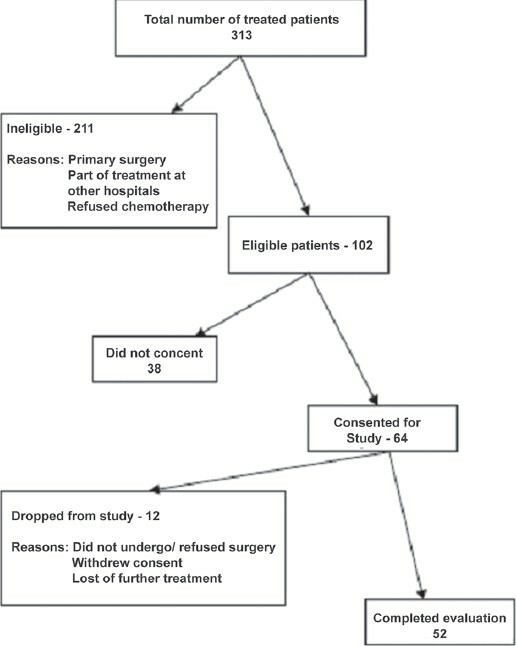 Conclusion: Use of induction chemotherapy with weekly regimen is safe and effective selected cohort of patients with locally advanced disease who are unfit for upfront radical treatment. Context: As of today, there is no validated standard method to assess clinical response of breast cancer to neo- adjuvant chemotherapy (NACT). Some centers use clinical dimensions while others use radiological measurements to evaluate response according to RECIST criteria. Aims: The aim was to correlate and compare the clinical, radiological, and pathological parameters for assessing the tumor response in patients of breast cancer receiving NACT. Settings and Design: Single institution, prospective nonrandomized study conducted over a 2-year period. Materials and Methods: Patients with diagnosed breast cancer were assessed for response to NACT prior to surgery using clinical and radiological techniques. This was correlated with pathological reponse which was assessed by measuring gross dimensions and Miller-Payne grading of response to chemotherapy. Statistical Analysis Used: Spearman's rho nonparametric. RESULTS: Fifty two patients completed the evaluation (out of 313 cases of ca breast treated during the same period) with a median age of 52.5 years. We noted a 26.9% clinical complete response (CR) and 19.2% had pathological CR. Clinical evaluation had a sensitivity and specificity of 73.5% and 88.5% respectively compared to 14.2% and 100% respectively for radiological assessment. Conclusions: Clinical assessment of response to NACT shows a higher sensitivity compared to radiological assessment. However the overall low sensitivity and specificity rates of clinical assessment mandate a search for a better method of evaluation. Introduction: Bone marrow involvement by a non-haematological malignancy gives an opportunity to identify the lodgement, invasion of metastatic cells and the response of the host to the tumor cells. The study was undertaken to assess the involvement of bone marrow with non-haematopoietic malignancies and its significance in establishing primary diagnosis in clinically unsuspected cases. Materials and Methods: This was a descriptive study which included record review of the departmental archives for the last five years (January 2007 to December 2011). 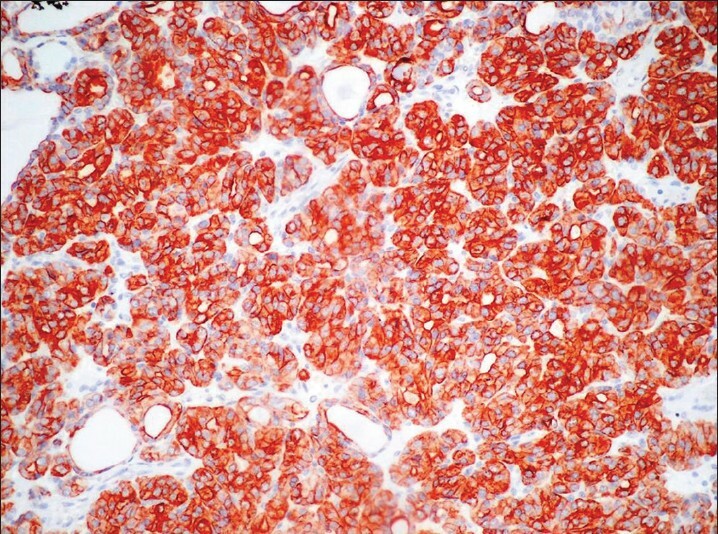 Eighty four cases were studied; which included clinically diagnosed non-haematological malignancy for staging or symptomatic cytopenias/bony lesions (group 1, n = 63), clinically suspected bone marrow metastasis of unknown primary malignancy due to symptomatic cytopenias/bony lesions (group 2, n = 07) and clinically unsuspected malignancy with incidentally detected bone marrow metastasis (group 3, n = 14). Results: Bone marrow metastases of solid tumors were identified in 23 cases (27.3%) which included 9 cases from group 1, 14 cases from group 3 and nil in group 2. Of the 14 cases in group 3, in 12 cases a definitive diagnosis could be made by correlating clinicoradiological findings with morphology and immunohistochemistry. The most common tumor in pediatric cases were neuroblastoma and Ewing's sarcoma (40%) and in adult's adenocarcinoma of gastrointestinal tract (30.7%) was the commonest. Conclusion: Bone marrow metastasis can masquerade as a primary haematopoietic disorder; however its detection has both therapeutic and prognostic significance. Immunohistochemistry is a useful adjunct to morphology in reaching a definitive diagnosis. Aims: The aim of the present study is to analyse the outcome and genotypic pattern of metastatic GIST patients which is largely unknown in India. Materials and Methods: The present study was a retrospective analysis of 24 patients of metastatic GIST. The case records were analysed for clinical profile, treatment response and prognostic factors. The archival samples were retrieved for c-kit mutation analysis in all but 5 patients for mutation analysis. Results: The median age of the study population was 56 years. At a median follow up of 29 months, the PFS was 45% at 2 years. Activating c-kit mutations were detected in 10 cases (52.6%). 80% of the mutations were located in Exon 11. Conclusions: The outcome of metastatic GIST patients has definitely improved from a virtually incurable state to a disease where median OS has reached 60 months. The genotype of Indian patients with GIST may be different from the western population which needs to be confirmed in a larger study. Context: Rigosertib, a potent, multi-kinase inhibitor that selectively induces mitotic arrest and apoptosis in cancer cells and is non-toxic to normal cells, is being developed for the treatment of solid tumors and hematological malignancies. Aims: To determine the safety, dose-limiting toxicities, and clinical activity of rigosertib administered by 2-, 4-, or 8-hour continuous IV infusion twice-a-week for 3 weeks out of a 4-week cycle in patients with advanced solid tumor or hematological malignancies; and to confirm the safety and tolerability of the recommended phase 2 dose (RPTD). Settings and Design: Phase 1, open-label, dose-escalation study in men and women ≥18 years of age. 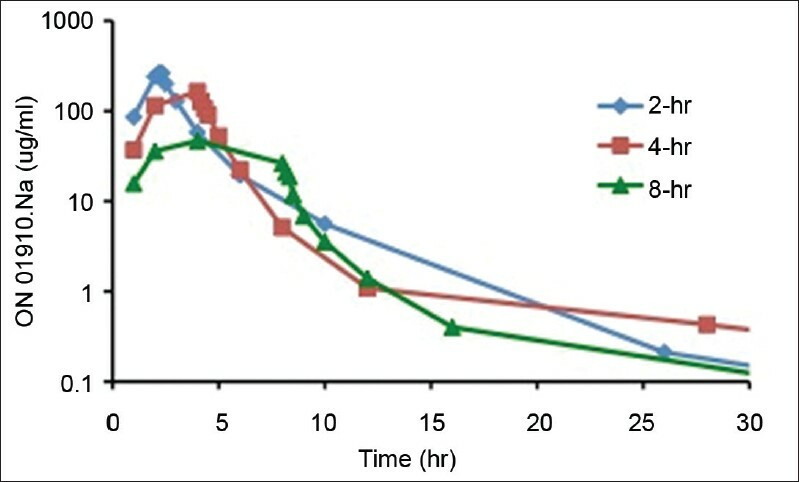 Materials and Methods: An escalation phase optimized the duration of infusion (2, 4, or 8 hours) of 3200 mg rigosertib twice-a-week for 3 weeks of a 4-week cycle; an expansion phase confirmed the maximum tolerated dose (MTD). Statistical Analysis Used: All data summaries were descriptive. PK parameters were estimated using compartmental analysis. Results: 25 patients (16 male, 9 female, 26-66 years, all Asian) were treated with rigosertib, 16 in the escalation phase; 9 in the expansion phase. MTD was determined to be 3200 mg as a 4-hour infusion and 2400 mg over 4 hours was declared to be the RPTD. Best response was stable disease in 5 of 14 evaluable patients, with a mean (range) of 90 (43-108) days. Conclusions: 2400 mg rigosertib as a 4-hour infusion was identified as the RPTD. Five patients achieved stable disease lasting 6-16 weeks. Context: Cancer data from Rajasthan is limited. Only three studies, one from Western Rajasthan, and the other two from Eastern Rajasthan have been published previously. Aims: To find out the spectrum of malignant neoplasms in Jaipur region by studying the proportion and site wise distribution of malignancy cases reported at five major hospitals and pathology centers in Jaipur region. Settings and Design: A retrospective analysis of histopathology records of 5 years (2004-2008) was done. Approximately 200,000 histopathology and cytology reports were analyzed and 34,486 new cancer cases were identified. Statistical Analysis Used: Percentages and proportions. Results: A total of 34,486 new cases of cancers were recorded in five years. There were 58.58% (20202) males and 41.42% (14284) females, with the male to female ratio being 1.41:1. Organ wise, Lung (13.25%), Larynx (5.35%), Oropharynx (5.09%), Brain (4.84%), Tongue (4.62%) and Prostate (4%) were the most common sites involved in males, whereas Breast (25.6%), Cervix (10.26%), Ovary (5.4%), Brain (3.68%), Esophagus (3.4%), Lung (3.01%) and Gall Bladder (2.35%) were common sites for malignancies in females. Conclusions: Significant findings were, a higher frequency of tobacco related cancers i.e., Lung cancer and Head and neck cancer in males, and screening detectable cancers (Breast and Cervix) in females. A higher frequency of Lung cancer in females was also noted as compared to previous studies. An unusually high frequency of Gall Bladder Cancers especially among the female population in this region is also a cause of concern. Our data was compared with the national data. Aim: The study objectives were evaluation of clinicopathological characteristics, correlations between the preoperative and postoperative tumor grades, and their implications on lymph node metastasis. Materials and Methods: We conducted a retrospective descriptive study of 131 cases of endometrial cancer examined and treated at a tertiary regional cancer institute between the years 2003 and 2009. We reviewed the oncology database as well as the clinical records and surgico-pathological registry of all these patients. Statistical Methods Used: All the summary measure computation and Chi-square test for comparing more than one proportion was done in spreadsheet (Excel). Results: The multiparity association with endometrial cancer was commonly seen 113/131 (86.2%). Twelve (9.7%) patients preoperatively diagnosed as Grade 1 tumors upgraded to Grade 3 changes in postoperative specimens and six of these 12 patients (50%) had lymph node metastasis. A total of 14/131 (10.6%) cases had lymph nodes metastasis. Conclusions: There is a poor correlation between the preoperative and the postoperative tumor grades. Routine pelvic lymphadenectomy may be a valuable method in low-risk cases and para-aortic lymphadenectomy may be limited to high-risk endometrial cancers. Background: The aim of this study was to assess the cosmetic outcome of patients undergoing oncoplastic breast conserving surgery in Indian population. 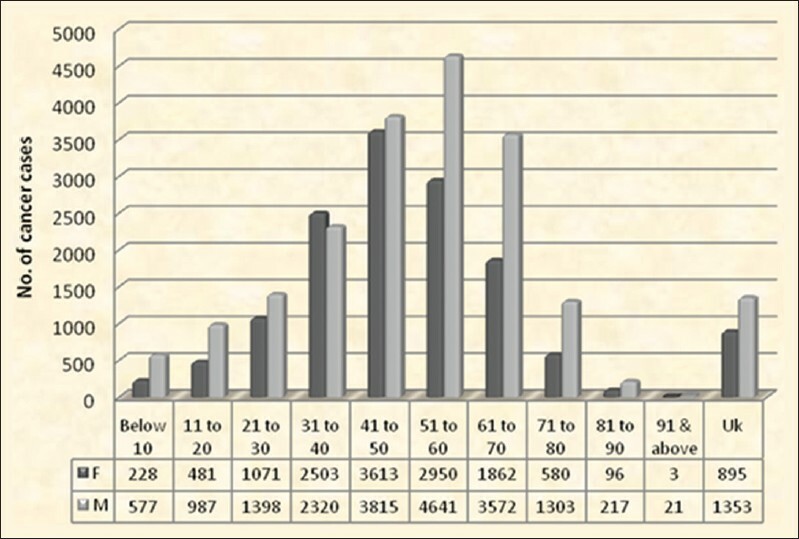 Materials and Methods: A prospective cohort of 35 patients who were eligible for breast conservation surgery was included in the study from year 2007 to 2009. Patients with central quadrant tumors were excluded from the study. A double - blind cosmetic assessment was done by a plastic surgeon and a senior nurse not involved in the management of patients. Moreover, self-assessment was carried out by the patient regarding the satisfaction of surgery, comfort with brasserie, social and sexual life after oncoplastic surgery. Results: In this study, 35 patients underwent oncoplastic breast conservation surgery by various techniques. The cosmetic outcome scores of the surgeon and nurse were analyzed for inter rater agreement using inter-class Correlation Coefficients. There was a good association between them. The risk factors for poor cosmetic outcome was studied by univariate analysis and significant correlation was obtained with age, volume of breast tissue excised and estimated percentage of breast volume excised (P < 0.05). Moreover, 96% of patients were moderately to extremely satisfied with the surgery. Patients were offered an option for cosmetic correction of contralateral breast by mastopexy or reduction mammoplasty however, none of them agreed for another procedure. Conclusions: Oncoplastic breast surgery helps to resect larger volume of tissue with wider margins around the tumor. It helps to achieve better cosmesis and extends the indications for breast conservation. Most of the patients were satisfied with mere preservation of the breast mound rather than a symmetrical contralateral breast. Background: The accurate diagnosis of benign and malign thyroid tumors is very important for the clinical management of patients. The distinction of thyroid papillary carcinoma follicular variant and follicular adenoma can be difficult. Aim: To investigate the alternative methods like immunohistochemistry and exon 15 in the BRAF gene 1799 T/A mutation analyses for distinguishing thyroid tumors. Materials and Methods: We applied immunohistochemical markers; CK19, HMWCK, Galectin-3, HBME-1 and Fibronectin and mutant allele-specific PCR amplification technique was used to determine 1799 T/A mutation within the BRAF gene. Formalin-fixed parafin embedded tissues from 45 surgically total resected thyroids, included 26 thyroid papillary carcinoma follicular variant (FV-TPC), 8 Follicular Adenoma (FA), 6 Minimal invasive follicular carcinoma (MIFC) and 5 Follicular Carcinoma (FC). Statistical Analyses Used: Pearson Chi-Square and Kruskal Wallis tests were performed. Results: There was a positive correlation between FV-TPC and HMWCK, CK 19, HBME1, Galectin 3, fibronectin (P < 0.05), but there was no correlation with FV-TPC and BRAF gene mutation (P > 0.05). HBME-1 and CK 19 stained strong and diffuse positive in FV-TPCs but weak and focal in FAs. Conclusion: Our study suggests that morphologic features combined with immunohistochemical panel of HMWCK, CK19, HBME-1, Galectin-3 and fibronectin can help to distinguish benign and malign thyroid neoplasms and FV-TPC from follicular adenomas. BRAF gene 1799 T/A mutation has been non-specific but its detection can be a useful tool combined with immunohistochemistry for diagnosing FV-TPC. Background: Recent studies indicate neoadjuvant chemotherapy (NACT) can result in R0 resection in a substantial proportion of patients with technically unresectable oral cavity cancers. However, data regarding the efficacy and safety of docetaxel, cisplatin and 5 fluorouracil (TPF) NACT in our setting is lacking. The present audit was proposed to evaluate the toxicities encountered during administration of this regimen. It was hypothesized that TPF NACT would be considered feasible for routine administration if an average relative dose intensity (ARDI) of ≥0.90 or more in at least 70% of the patients. Materials and Methods: Technically unresectable oral cancers with Eastern Cooperative Oncology Group PS 0-2, with biopsy proven squamous cell carcinoma underwent two cycles of NACT with TPF regimen. Toxicity and response rates were noted following the CTCAE 4.03 and RECIST criteria. Descriptive analysis of completion rates (completing 2 cycles of planned chemotherapy with ARDI of 0.85 or more), reason for delay, toxicity, and response are presented. Results: The NACT was completed by all patients. The number of subjects who completed all planned cycles of chemotherapy are with the ARDI of the delivered chemotherapy been equal to or >0.85 was 11 (91.67%). All toxicity inclusive Grade 3-5 toxicity was seen in 11 patients (91.67%). The response rate of chemotherapy was 83.33%. There were three complete response, seven partial response, and two stable disease seen post NACT in this study. Conclusion: Docetaxel, cisplatin and 5 fluorouracil regimen can be routinely administered at our center with the supportive care methods and precautionary methods used in our study. The management of hormone receptor-positive Her2-negative breast cancer patients with advanced or metastatic disease is a common problem in India and other countries in this region. This expert group used data from published literature, practical experience, and opinion of a large group of academic oncologists, to arrive at practical consensus recommendations for use by the community oncologists. 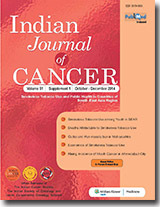 Oral cancer is one of the leading causes of human morbidity and mortality especially in developing countries like India. Tobacco consumption in smokeless and smoking form along with alcohol is considered as the primary risk factors. Tobacco is a major health challenge with various tobacco products available for use which are known to have deleterious effects on the oral mucosa. The oral lesions caused by tobacco are inclusive of those that are less likely to progress to cancer; lesions with increased tendency to develop into cancer and cancerous lesions. Prevention and control of tobacco induced oral mucosal lesions is the prime requisite currently and mainly involves measures undertaken at primary, secondary and tertiary levels. Primary prevention plays a pivotal role in tobacco induced lesions and steps can be taken at policy level, community as well as individual level. This review paper focuses on the epidemiological data of tobacco induced oral mucosal lesions in India available in the literature with an overview on various strategies for their prevention and control.